​"He described it as a vastness that you can't even imagine." This kind of description is often heard in the accounts of those who have had near-death experiences and describe the paradoxical nature of "life" after death. They talk about how there is no time at all and no real place--and at the same time might say things like, "It was more beautiful than any place I had ever been, but it was not a place really..." or "I felt I was gone an eternity but also just a moment in time." This paradoxical quality sometimes reveals itself in the hours or days right before dying through the phenomenon of terminal lucidity. Healthcare professionals and loved ones interviewed for FWP have shared stories of people who were otherwise non communicative and then hours or days before dying became completely lucid to offer words of forgiveness, reconciliation, or guidance. "My father was in a coma but came out of it just long enough to say his final words, 'Tell everyone I'm okay--and that I love them!'" All the words I have gathered so far in interviews spoken during terminal lucidity are reassuring or loving. One could imagine that at a time of clear thinking, a parent who is dying could just as easily say to his son, "For goodness sakes, isn't it time you got a decent job and dump that wife of yours? Here I am on my death bed, and you have not even dignified my life in any way!" "My mother had Alzheimer's for several years, and I could not make sense of most of what she was talking about, but then two days before she died she said, "Son, go to my desk in my study. Three drawers down on the left-hand side you will find all the financial information you need after I am gone." So how can it be at a time when our brains are most degraded as we teeter at the edge of death, that such lucidity can emerge before dying? This is one of the greatest paradoxes in the research of the language of the threshold. As we look at the pathway of language at the end of life, we see a fascinating continuum that leads us away from literal language and our literal understanding of our world to more complex language and more paradoxical experiences. As we die, we leave behind the literal language of our ordinary lives and begin to speak more in symbols and metaphors. It appears that as we approach death, the areas in our brain associated with literal thought and language give way to a new way of speaking and thinking. Does this shift represent a larger movement away from this dimension to another? When we look at the utterances of the dying, the language often forms a continuum, and this continuum correlates with brain function. The continuum spans from literal, figurative and unintelligible language--and then finally to nonverbal communication. The continuum starts with literal language. This is language of ordinary reality, the five senses, what we see in front of us: the facts. Brain scans reveal that literal language, such as "That chair over there has four brown legs and a white cushion." activates the left hemisphere. The left hemisphere houses the regions that are traditionally considered the speech centers. However, the we see shifts in brain scans when people speak metaphorically. An article in Scientific American tells us that a sentence such as "The chair over there looks like a koala bear." engages both the left and right brain hemispheres. The right hemisphere has traditionally been associated with the more ineffable aspects of life: music, visual art and spirituality. Metaphors appear to be a bridge between both hemispheres and perhaps two different states of being. Andrew Newberg and Mark Robert Waldman, authors of How Enlightenment Changes Your Brain have done extensive research into how altered and transcendent states correlate with brain function. They describe having observed immediate decline in activity in the language areas of the frontal lobes of Pentecostal participants speaking in tongues. They explain, “Normally when you talk and listen to others, the communication centers in your brain turn on, but when a person begins speaking in tongues, these areas shut down.” Similar changes in brain activity occur during trance states in shamans and mediums. Newberg and Waldman say that these neurological changes create the pathways to enlightenment experiences. On his website, Eben Alexander, author of Proof of Heaven and Maps of Heaven, shares some interesting research on hallucinogens and the brain that supports Newberg and Waldman’s findings and sheds light on the language used at the end of life. Research at Imperial College in London in 2012 revealed that among people under the influence of psilocybin, those whose psychedelic experiences were most profound had “greatly diminished” activity in the “major connection regions” of the brain. Alexander also references a Brazilian study completed in 2015 that researched the effects of ayahuasca and confirmed a decrease in activity throughout an important region of the brain called the default-mode network. Alexander cites yet another study at Imperial College, this one on the effects of LSD on the brain, which found that a diminished integrity of certain regions of the brain seemed to be associated with extraordinary states of consciousness. As my neocortex was destroyed by the invading bacteria, my conscious awareness greatly expanded to levels unprecedented in my normal waking experiences of my entire life. That shocking reality nagged at me especially in the early months after my coma, at a time [when] I was trying to explain the whole experience as a vast hallucinatory trick of the dying brain (defaulting to my pre-coma reductive ma- terialistic scientific beliefs, honed by several decades work- ing as a neurosurgeon). My doctors knew from the medical evidence in my case that my neocortex was far too damaged to be supporting any mode of robust conscious experience, including any elaborate hallucinations, drug effects or dream states. After extensive review with some of the doctors who cared for me, and with several interested colleagues in neurosurgery, it became apparent that that ultra-reality occurred because the experience was real, although it did not occur anywhere in our 4-dimensional space-time of the observable physical universe. I asked Andrew Newberg if it might be possible that, as we begin dying and the speech centers associated with language diminish, we have increasing experiences of mystical states like those described by Eben Alexander. These states of mind may also be associated with the nonsense that we hear. Newberg said he thought it is very possible that as we die, brain function associated with logic and reason — and with the production of purposeful speech — does, indeed, shut down. This could cause, for the dying person, a number of experiences that are mystical in quality and rich in unintelligible speech. Could it be that as we die, the brain centers associated with literal and linear language lose their dominance? Other regions of the brain become more prominent and lead to more metaphoric and unintelligible language that might also lead to new states of being? Paradoxically, then, as functions of our body diminish, consciousness, it appears, may expand. This new condition may relate to what Kenneth Ring, the author of Mindsight, calls "transcendental awareness." He coined this term when researching the near-death-experiences (NDEs) and out-of-body-experiences (OBEs) of the blind. The majority of the participants (80%) in the study--even those who were been blind since birth--described being able to see during their OBEs and NDEs. In some of the cases, participants described details, such as the color and patterns of a doctor's tie, or the snowfall outside the window, the physical traits of specific medical personnel, family members and their own bodies "below." The details were corroborated by others during the research. The participants explained that during their OBEs and NDEs, they could see as they had never seen before in waking life or in dreams. As Ring explored the participants' notion of seeing during these experiences, he discovered that their perceptions were actually synesthetic; they were a synthesis of many senses. 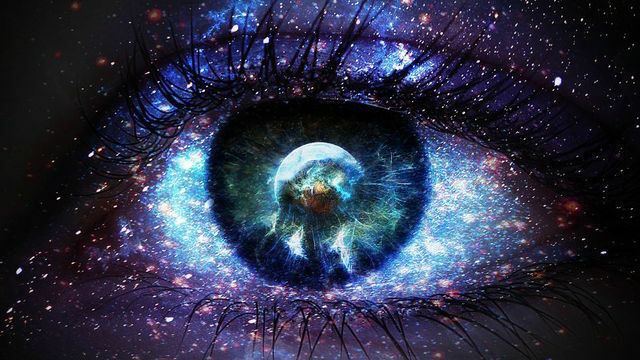 They described seeing, hearing and feeling all at once, and he called this kind of perception "transcendental awareness." It is possible, then, as we die, we move away from our usual sensory awareness to something different--something that actually includes all the senses at once. Synesthesia is the blending of the senses. An example is: "I could just feel the music in my body, and then see images of dancing flowers kick up their pink legs to the rhythms I felt and heard." "I was sitting next to a magical stream. The stream was made of rippling waves of brilliant light. The stream moved with a flow of enchanted sound. If you could hear the stream, my darling sister, even just for a second, you would probably never feel afraid or angry." Perhaps the changes we see in language at end of life are part of the process of developing a NEW-sense-- not nonsense. This new sense is the transcendental awareness described by the participants in Ring's study and other near-death and out-of-body experiencers. "I was home. That was what if felt like, the ultimate homecoming. I was where I was meant to be. " "The rapture and peace were beyond my wildest imaginings and I wanted to stay there forever and ever." The stories of people who have died and then have been revived are compelling. From our research into final words and the accounts of those who have had near-death experiences, it appears that something exists beyond the threshold. And yet, it may not be heaven as we think of heaven. Just as Roger Ebert shared in his poignant final words, it may be a vastness that we can only begin to imagine. Final words may be the tracks in the sand that will lead us to a closer view so that we may better understand consciousness and the paradoxical language and conditions of end of life. ** Find out more about near-death experiences in Raymond Moody's classic 1975 Life After Life where he coins the term "near-death experience" and at iands.org and nderf.org. Paul Perry has also co-authored an impressive list of titles with a number of physicians who have documented and researched near-death experiences following Raymond Moody's groundbreaking inquiry.